Most visitors to Key West are taken by its history. Its precarious location at the end of the road has produced atypical themes that make the island unquestionably weird, and its city cemetery is no exception. Its mix of quirky epitaphs, odd stories, wild iguanas, and the beloved interred all make up the fabric of Key West today. 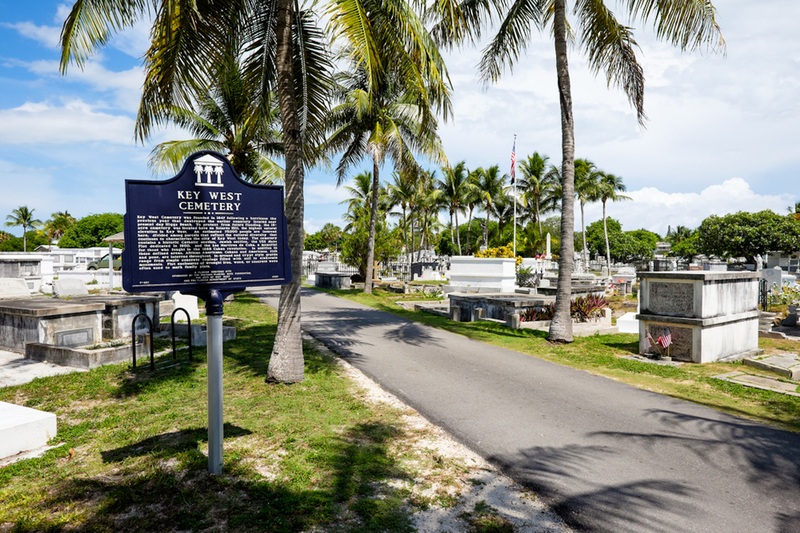 A visit to the cemetery is a must for your Key West tour, because even the dearly departed say something about the Conch Republic – from its varied past to its morbid sense of humor. The cemetery at Passover Lane and Angela Street was founded in 1847, after the former seaside graveyard was unearthed by a hurricane the year prior. Because of this, some of the recovered tombstones in the cemetery are older than the actual cemetery itself – see if you can spot any. Today, the 19-acre graveyard contains upwards of 80,000 plots, many of which are above-ground crypts. The cemetery also has Jewish, Catholic and Cuban sections. You won’t miss this large memorial located near the main entrance. The explosion of the USS Maine by the Spaniards in 1898 killed 260 Navy sailors and officers, launching the onset of the Spanish American War. About two dozen of its victims are at rest in this dedicated plot, lined with an iron gate. A memorial dedicated to “los martires de Cuba” can be found in the graveyard, devoted to those who died in the Cuban Revolution. Known for his fishing skills, friendship with Ernest Hemingway and Duval Street bar, you can find the resting place of this significant Key West figure today. The family plot of Prussian immigrant Joseph Otto, the space contains the remains of old pets, including a domesticated Key West deer (Elfina) and three Yorkshire terriers. We suggest the cemetery entrance at Passover Lane and Angela Street, where you can pick up a walking tour guide of the cemetery and explore at your own pace. If you plan to take a trip on the Old Town Trolley Tour, the cemetery is stop number 13. This is also a popular stop for the ghost tour companies on the island, which you can read more about here. Interested in Key West history? Visit the Hemingway Home, peruse sunken treasures at the Mel Fisher Museum and explore the historic Old Town during your stay in Key West. Book your stay with 24 North Hotel and enjoy the best amenities at the best price.